The role of a medical director has evolved over the last ten years to one of huge complexity. Medical directors at university hospitals lead medical education and training, research, clinical quality improvement and support the delivery of national standards. With over 150,000 doctors working in the NHS, a key role of the medical director is to ensure that doctors maintain the level of training and development required to meet patient needs. Through the Medical Directors Group, the most senior doctors in the country can work together to enable continuous improvement in the care that is offered to patients. The current chair of the Medical Directors Group is Professor Meghana Pandit, Medical Director at Oxford University Hospitals. The group is supported by Dr Rachel Chall, Senior Policy Officer at UHA. 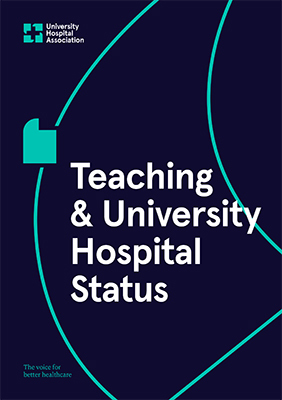 We are the largest unified voice of the UK’s university hospitals, compromising of 44 specialist trusts. Our national groups allow the sharing of issues and solutions for key areas in the health service. Our latest documents, informed by our members, their research and first hand experiences, to inspire healthcare change. © 2019 | UHA, all rights reserved.